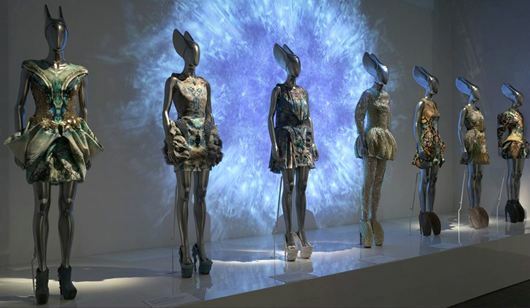 My summer visit to New York City could not have been complete without stopping by the second floor of The Metropolitan Museum of Art – aka “The Met” – to tour Alexander McQueen: Savage Beauty. All organized by Curator Andrew Bolton and Harold Koda, both of The Costume Institute, along with assistance from his former fashion show production designers. Close to 200 ensembles and accessories from the Alexander McQueen Archive in London, Givenchy Archive in Paris as well as private collections, were grouped according to McQueen’s Romantic fixations. Lines for the exhibit can reach up to an hour – more than worth the wait, although I was lucky enough to only stand by about half of that. Once inside, the packed crowd moved along surprisingly smoothly from room to room. The tour began by setting the tone with two mannequins who, like the theme of many of his collections, were polar opposites. On the left, a dress of red and black ostrich feathers adorned with red painted glass medical slides. On the right, a striped and varnished razor-clam shell dress, both from the VOSS, spring/summer 2001 collection. Onto “The Romantic Mind,” showing McQueen’s signature “bumster” design – pants so low that they revealed, yes, the mannequin’s bum! 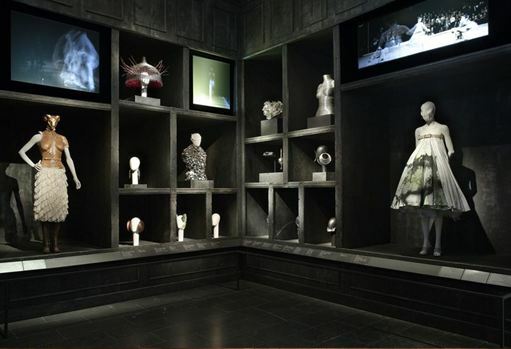 Accessories such as shoes in the shape of a mutated spine, butterflies and headpieces all inspired by Edgar Allan Poe were displayed next in the “Cabinet of Curiosities.” The video in this room was such a unique element capturing Alexander McQueen’s ability to turn a runway into an artful performance. One of the most intriguing was a white dress worn by Shalom Harlow in the spring 1999 show, along with a video of the dress being spray painted black and yellow on the runway. The atmosphere of each room kept perfectly in tune with the all of the pieces and music. In a proud, regal tribute to his Scottish roots, were McQueen’s first tartan designs. 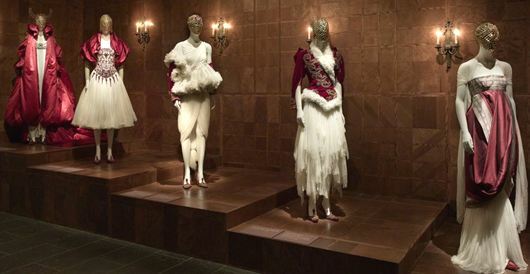 The exhibit went on to show “Romantic Primitivism,” the focus of McQueen’s first post-grad runway collection, complete with horsehair and antelope horns. While beautiful: definitely not for the faint of heart. Difficult to choose, but my favorite gallery may have been the “Romantic Exoticism” – think Asian-inspired silhouettes, silk and previously fresh flowers. The journey ended with “Romantic Naturalism,” by far the most wearable pieces for us everyday fashionistas and Alexander McQueen’s last fully materialized collection before his February 2010 death. Included were dresses and leggings in vibrant, earthy colors accompanied by outrageously high heels – the same heels worn and made famous by Lady Gaga. Overall, The Met was a great way to start my weekend in the city with the most unique designer collection I have ever had the pleasure of seeing. Words really cannot do the exhibition justice, it is a must see for anyone visiting the city before August 7th! If you can’t make it to New York, the Met store’s website has plenty of fashionable souvenirs. Making a fashion statement is like taking a short cut through a terrifying forest. It’s far from being safe… living on the dangerous side is more like it! It’s risky business – your fashion statement could be saying the wrong thing. Don’t get me wrong, there’s good reasoning to make the statement and worth the risk. Particularly if you’re a fashionista who loves unique pieces that make a statement all on their own. Sounds like me! This is why I choose some surreal shoes that will make a loud fashion statement of being unique, colorful and fashionably bold. The first statement shoe is the Angel Bootie by Alexander McQueen. These shoes were a part of McQueen’s last collection before his early and unexpected death. 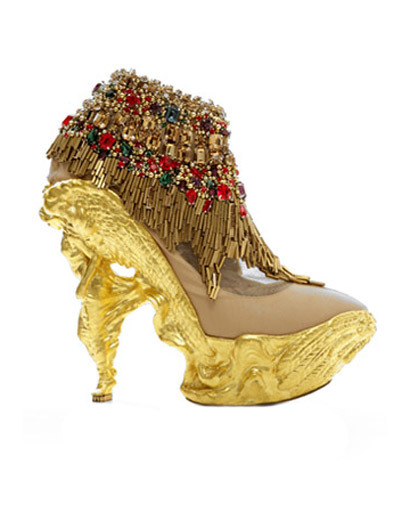 Royalty would be honored to wear such a beautiful craftsmanship pair of gold heels. These gorgeous blue ankle booties are made by Pollini for Manish Arora. Feel like a goddess from Hercules’ time! The royal blue color makes them POP while the three-dimensional gold detail steals some of the attention from the vibrant blue color. Make a fashion statement by having a cool do on your…feet? These Palais Mohawk pumps in purple suede made by Yves Saint Laurent will surely make your feet stand out. The cool girl with a rebellious attitude will love making a fashion statement with these bad boys. Watching a recent episode of Project Runway, I found myself paying more attention to Heidi Klum’s ensemble than what was being put onto the runway. Her judge’s chair seemed to resemble a throne as she sat proudly in a gold shimmering top, neckline adorned with blue and silver jewels. Where had I seen this look before? Ancient Egypt, perhaps? With her glowing skin and perfectly styled bob, Heidi did in fact, resemble an ancient queen. After thoroughly admiring the star’s look, I began to wonder what other modern twists on ancient beauty graced today’s fashion world. Badgley Mischka’s most recent collection features a seductively fluid gown in light aqua. The one shoulder detail is wonderfully reminiscent of a Roman toga, especially with coordinating gold jewelry. A few collections ago, Alexander McQueen presented a collection taken straight from the Dark Ages. 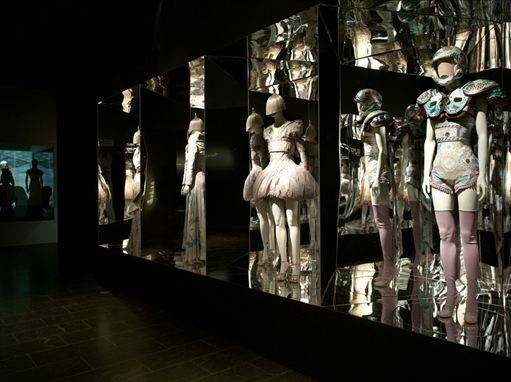 Several pieces resembled fashion forward armor, complete with feather adorned helmets. One exquisite gown befitting of a medieval princess revealed delicate chiffon peeking through a beautifully sculpted robe-like garment. After browsing a plethera of collections, I found more ancient Egypt and a few Grecian inspired pieces. Beautiful draping and shining embellishment is certainly no modern idea. In fact, the roots of nearly any spectacular garment can probably be found at the Smithsonian.